Bob Hutton started in radio in 1954 with CKCK Regina and did his first curling coverage working with Lloyd Saunders in 1955. He was the first, and Bob believes, only broadcaster to provide rock by rock coverage of the Canadian Schoolboy Championship in 1969 played in North Battleford, and won by the Robert Miller team of Shellbrook. He was also the first to establish 5 and 30 minute radio shows dedicated exclusively to curling and has covered curling at all levels. Local coverage was as important as a Provincial, National or an International competition. Bob reported ALL levels of Men’s, Women’s, Mixed, Junior’s, Senior’s and Master’s competitions. 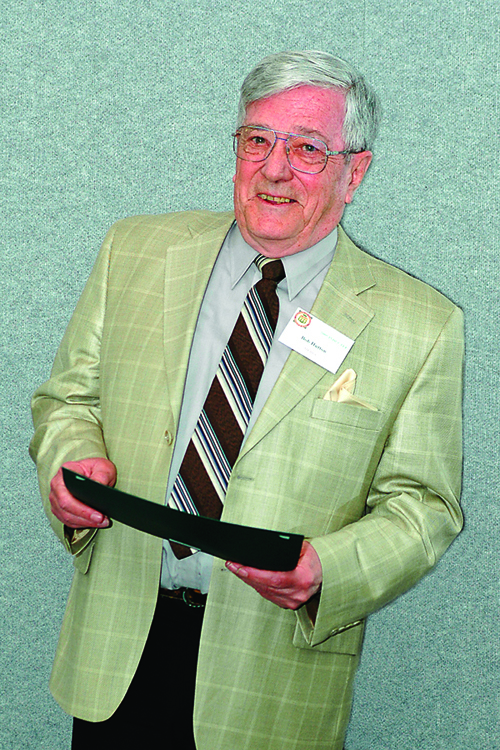 Bob Hutton was the first reporter to be awarded Honourary Life Membership in the Saskatchewan Curling Association (SCA) in 1983 and in 1984 he received the Canadian Curling Association’s Award of Merit. Bob has received several individual community awards and has life membership with the Tartan Curling Club and the former Regina Curling Club.